"This was found in the Majestic Hotel Colorado in Glenwood Springs, Co.
which a local inspector rented. Oops!" I personally find it strange and somehow inconsistant that the switch would be allowed if it was moved to be not directly within the shower/Tub limits. Anyone from New Hampshire here? several years ago I stayed in a fairly new condo complex in southern NH and was surprised to find that the Bathroom light switches were outside the room! I was told by someone that it was by their code. Is this true? It did not make me feel very comfortable having the light control out of my reach. I think there should be a compromise somewhere. Proposal 9-77 in the '92 TCR and the associated comments in the '92 TCD resulted in the first rules in the NEC to prohibit the installation of switches in the shower or tub enclosure. Up until that time the code permitted weatherproof switches in that location. The proposals and comments requested that the switches within 5' have GFCI protection. The CMP only accepted in principle, and the rule in 380-4 for the '93 code only said; "Switches shall not be installed within wet locations in tub or shower spaces unless installed as a part of a listed assembly". In the '96 code this was modified to say that any switches in these areas must be a part of a listed tub or shower assembly. 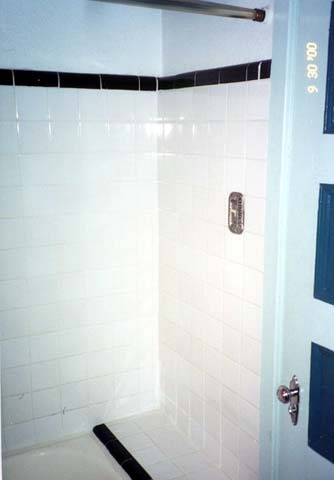 Proposal 9-86 in the '98 ROP would have required that switches and receptacles not be located within 36" horizontally of a bathtub or shower enclosure. This was rejected by the CMP with the comment that the existing wording in 380-4 for switches is adequate and that the location of receptacles is not within the scope of Article 380. In the '01 ROP another proposal, 9-74, was made to require switches be outside of the "bathtub and shower zone". This proposal was also rejected. In the '96 code, 410-57(c) first appeared prohibiting the installation of receptacles in bathtub and shower areas. A proposal, 18-70, was made for the '99 code that would have placed a 3' limit from the bathtub or shower enclosure for receptacle placement. This too was rejected by the CMP. Another proposal, 18-46, was made in the '01 ROP to have a 5' limit for the receptacle location. Again rejected by the code making panel. It appears very clear to me that both CMP 9 for switches and CMP 18 for receptacles are only intending that the switches and receptacles be outside of the bathtub and shower areas, but that there items are permitted to be installed immediately adjacent thereto. Oddly enough, I just had a similar situation come up. New buyer want things fixed that her inspector had noted prior to the sale. While looking at the house, I notices that the "jacuzzi tub" (no shower) had open track lights on the wall, about 5' above the top of the tub. The dimmer for these lights was about 3' above the tub. I replaced the track lights with an enclosed, recessed ceiling light, and put it all on a GFI breaker. Here, I was trying to apply my "understanding" of pool & spa rules, which permit switches in areas where receptacles are forbidden. I am open to comments/criticism of my actions. I just wanna know what course of action did the inspector take? I mean.... that should at least been room service or free drinks at the hotel bar! Watch the July issue of CEE News for an even more dramatic photo along this theme. It was also taken by the same Inspector. practice against this sort of thing. also need to feed an SELV fan or light. That sort of stunt would really bristle some Brits....they don't even allow such switches on a regular bathroom wall (I.E not inside the bathtub)!!!! Maybe the cowboy did this after the inspectors got done? Wall switches are allowed in bathrooms in Britain so long as they're out of reach of anyone in the shower or tub. Out of reach was defined as 6 ft. in the past, now 2 meters. In some of our small bathrooms that does indeed mean no wall switch allowed!